The process required to plan, develop, and execute a protocol can be a challenge for many organizations in terms of time, resources, and existing capabilities. Resettlement agencies can address this by approaching it in stages to ensure that the necessary elements are considered along the way. 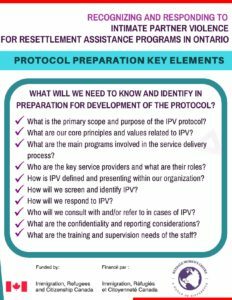 This one-page checklist provides the initial planning stage exploration questions that can be used to identify key information, roles, responsibilities, and existing resources required to embark on development of the protocol. The checklist is referenced in the webinar for those who will be acting in this capacity.